On Easter Monday, Dublin City Public Libraries took part in RTÉ Reflecting the Rising in Smithfield Square. The DCPL Learning Bus and Mobile Library took pride of place in Smithfield accompanied by the Dublin Fire Brigade’s vintage ambulance and Fire Men in vintage uniform. Staff members from Dublin City Public Libraries who were dressed in period costume were joined by the author of Fallen Lia Mills and members of the Irish Great War Society and the Dublin Brigade Irish Volunteers. 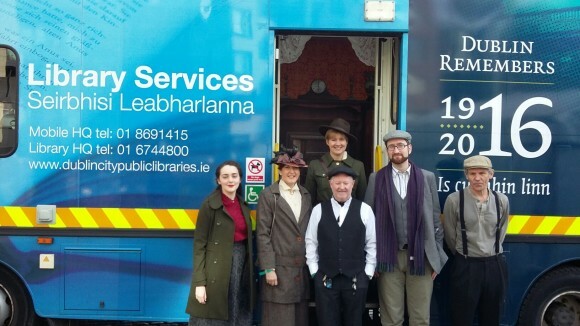 Members of the public seized the opportunity to climb aboard the Learning Bus which was decorated as an Edwardian Living Room and once aboard they could view images from Dublin in 1916. The Mobile Learning Bus provided people with the chance to discuss Fallen with Lia Mills and also to borrow books on a wide range of history topics.